A happy, well-adjusted dog is a joy to live with. A puppy has so much potential just waiting to be developed. Sights, sounds, smells, tastes and textures are all new to her. A puppy learns by exploring her environment, investigating everything in her path. To help her mature into a friendly and outgoing adult, it’s important to encourage exploratory and social behavior. Socializing your puppy to new things should be a positive and pleasant experience for her. Learning is stressful. Expose her at a rate that she can absorb new information, not be overwhelmed by it. 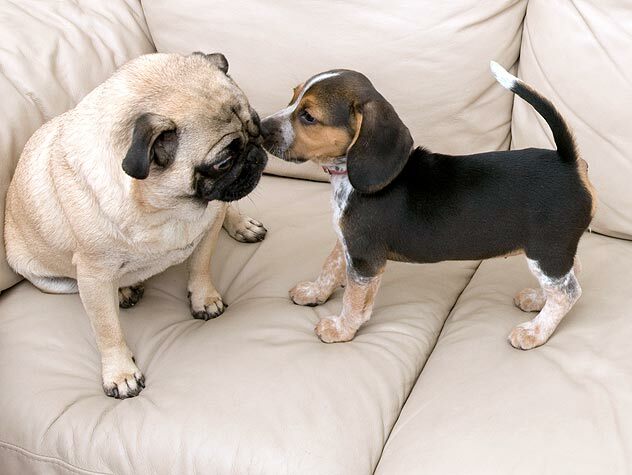 Socialization is an ongoing process of changes and additions in a puppy’s life. As she matures, she will develop a catalog of experiences that help her to manage the world at large. This includes forming relationships with all types of people, other dogs and different species in various environments. From three to twelve weeks of age, a puppy is in one of the most important developmental periods of her life. She is receptive to new things that later may prove to be more difficult for her to adjust to. Regular handling by a variety of people during this stage is essential for her to form positive attachments later. The desire to bond with humans should be capitalized on at this stage. A puppy usually goes into a new home at seven to nine weeks of age. She is ready to transfer to her “human” pack at this age. If you are adopting an older puppy (over 12 weeks) and she has had limited socialization, you may have to work harder at first. A puppy adopted from a shelter may not have a known history. It is not too late to teach her what the world is about. Some puppies are shy, others bold and outgoing from day one. Learning to observe the signals a puppy gives helps in the socialization process. A confident puppy will advance towards new things with her tail up or wagging, ears forward and a relaxed facial expression. A hesitant or fearful puppy may hang back, holding her tail low or tucked and have a facial expression that might appear worried. A shy puppy needs more time to adapt but if not forced, can become more confident. When first socializing your puppy, focus on confident responses and praise her for her bravery in new situations. Once away from her littermates, a puppy needs to learn self-reliance. The first few days can be an adjustment period for both of you. For the first few nights, most young puppies will object loudly to being alone. A large stuffed animal she can cuddle up to helps to keep her company. You may also choose to keep her crate or bed in your bedroom, to ease her loneliness. Choose an area in your home to become your puppy’s den. Spending time there will be important for her to build self-confidence and cope with being on her own. Allowing her free run of your home gives her too many unsupervised choices as to what to chew, jump up on, chase, or destroy. Use of a confinement area also reinforces her denning instinct which helps with housetraining later. For a place to call her own, a crate or small gated area works best. Provide her with a couple of chewable items in this area to teach her what is hers. Confinement balanced with free time helps to teach a puppy self-control. A puppy that shadows your every movement may tend to overbond and become very stressed when left alone. If left alone too much, she will not receive the social contact she needs which often leads to boredom-related behaviors like shredding newspapers. Balance the time she spends in her den with supervised free time. As her house manners improve, her greatest reward can be to receive more freedom. If a puppy complains loudly about confinement, do not release her immediately or she will get louder the next time. Wait for a few moments of silence and praise her sweetly by saying “Good Quiet.” Helping her to associate her silence with the word makes it possible to use it as a stronger “QUIET” when she is noisy. 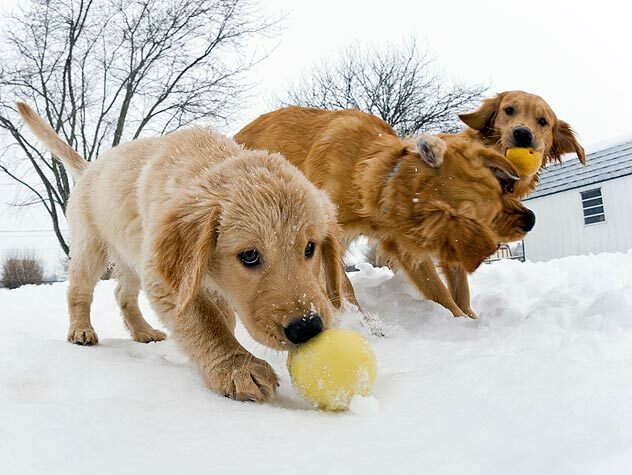 Most puppies would rather race around like wild things than sit quietly by your side. Your puppy should not be encouraged to do anything now that you would not like when she’s fully grown. Rewarding her for good behavior increases the likelihood of it recurring. Structuring her free time with games and toys provides an outlet for the “puppy crazies.” Rewards come in many forms. For some puppies, your eye contact is all that is needed to motivate them to mischief. Other puppies may find rewards in your cat’s litterbox. Attention, eye contact, vocal praise, petting, edible stuff, are all forms of rewards for a puppy. Timing a reward to coincide with a behavior you like should occur during after the desired behavior. Correcting a behavior should also occur within this time frame. Delayed corrections are punishment and don’t provide enough information for her to get it right the next time. Introduce her to new items gradually. For example, indoors a vacuum cleaner is often a top panic producing experience. It’s large and loud and moves! To show her that it is no threat, put the vacuum in the middle of a room. Allow her to investigate it in its dormant (turned off) state first. Next, turn it on for a second, turn off, put a tasty treat on it and walk away. At first, she may show no interest in investigating the machine. Encourage her if she approaches the vacuum, but never force her. Hopefully, she will take the treat and gain confidence as you repeat this many times, leaving the vacuum on longer each time. When she readily approaches, start moving the vacuum slowly before turning off. The more this is done and she realizes that nothing is hurting her, the faster she will take it in stride. Puppy Kindergarten Training (PKT) classes are available in many areas. These classes are structured to expand a puppy’s experiences during a time that they are unable to go outdoors. A well-run class will teach basic manners, build confidence and attempt to prevent problem behaviors from developing. Attention spans are limited at this age. Reward-based training, with an emphasis on luring into position, often works best. PKT also teaches puppies of all kinds to be appropriate with each other, regardless of size. Check with your veterinarian before signing up for a class. Most will allow attendance after two sets of vaccinations. Walks are important for your puppy. They provide more than just an opportunity to go to the bathroom. Try to vary the route for your walks daily. This automatically exposes her to a wider variety of experiences. At first she may be overwhelmed and freeze in place or try to take off. She is not being stubborn when she stops. All puppies have an instinct to react to situations that startle them — it is genetically hard-wired and is based on survival. Do not to comfort her with “It’s okay” as this reinforces her fearful reaction. Praise her when she appears to make the choice to investigate. Timing is crucial when praising to give her feedback for the appropriate response. Choose a less busy area for the next walk and she will adjust more rapidly. Socializing a puppy to people on the street is usually easy. When people ask to pat her, start teaching her to “say hello” by sitting. This automatically teaches her not to jump up to receive attention. Puppies need to learn to greet children as well as adults. Young children and young dogs tend to fuel each other’s energy levels. For a shy puppy, the approach of a child may intimidate her. It is important to teach her that kids are no threat. Choose a bench near but not next to a schoolyard or playground. Find what her comfort zone is with children. How far away does she have to be to not respond to them? If it is ten feet, start praising her for calm responses when children are beyond that zone. Eventually, your goal will be to teach her that receiving attention from children is safe. If a low-key child wants to pet her and she seems okay with that, make sure she isn’t backed into a comer. This gives her the option of moving away when she has had enough. Never physically hold a puppy in place to be petted by a stranger. Having a stranger offer her a treat may get her to approach, but that is different from being forced to interact. Do you plan to take your puppy on errands, to the beach, to the park? If so, what association would you like her to have with car travel? The car can cause a lot of stress in some puppies. If at first her only rides are to the veterinarian, she may develop negative associations with cars. Vomiting and excessive drooling are some of the signs that she is stressed. Make cars a fun place for her. Bring along a favorite toy and play with her in the back seat for a few minutes. Then take a short drive around the block and play with her briefly again before going inside. Avoid traveling with her if she has eaten recently. The use of a crate for car travel makes most puppies feel safer. If you do not use a crate, secure her leash (attached to a body harness) to a seat belt when driving. To prepare her for veterinary visits, touch and handle her all over on a daily basis. She will also need to be comfortable with strangers handling and gently restraining her. Make mock veterinary visits to build a positive association for her. Go once weekly and ask the staff to give her treats. This way, she will go to the veterinarian’s office five times a month and have something unpleasant happen only once. You may actually end up with a puppy that looks forward to her vet visits. Teaching a puppy to eliminate outdoors is a form of socialization. It requires an understanding by the puppy of where to go as well as her feeling comfortable in different settings. Puppies that are paper trained initially may “hold it” to go back indoors. For them, the concept of going to the bathroom includes the feel of papers under their feet, a roof over their head and usually no human at the end of a leash — if even in the room. Your puppy may not immediately generalize that concrete or grass beneath her feet, wind on her face and you at the end of the leash is the same thing. The use of a phrase like “HURRY UP” introduced at the time she is going on the papers can later be used as a prompt outdoors. Taking her to the papers on leash, as a transitional phase, may also help. From the beginning, vary the surfaces you take your puppy to for elimination. Surface-specific puppies only want to soil on one type of surface — only grass or pavement. This can cause difficulties later if you move to another area or want her to travel with you. Many dogs that are re-homed during adolescence are products of an undersocialized upbringing. It takes an investment of time and effort to raise and train a puppy properly. What you put into a puppy that first year influences the rest of her life. Socialization is ongoing. As she matures, different issues may arise. A puppy that has been exposed to the world outside her back yard has a better chance of taking things in stride. A well socialized dog makes a wonderful companion and will be welcomed anywhere you go. It's best to begin socializing your dog when she's still a puppy. Get tips to start the process. How Can I Get My Dog to Like Other Dogs?